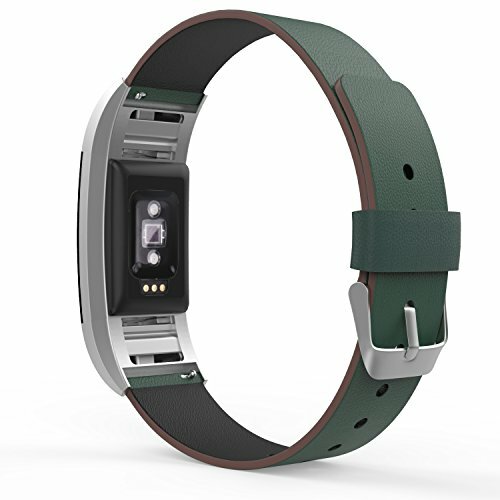 Custom designed for your precious Fitbit Charge 2 Heart Rate + Fitness Wristband, this MoKo Fitbit Watch Band features a combination of functionality and style. * Made of genuine leather, with sweatproof coating interior, this simple low profile designed band is lightweight and durable, easy to install and remove. * Fits 5.70"-8.46" (145mm-215mm) wrist and 0.7"(18mm) in width. Flexible wristband with fashionable craftsmanship for comfortable day to day wear. Fits 5.70"-8.46" (145mm-215mm) wrist and 0.7"(18mm) in width. Made of genuine leather, with sweatproof coating interior, this simple low profile designed band is lightweight and durable, easy to install and remove.